Bénédicte, Benoît, Djaffar, Maxime, Oussama and Sylvain are studying plastics and composites technology at the "Institut Supérieur de Plasturgie d'Alençon" (ISPA) in the capital of the Orne department in Normandy. They were guest trainees at IKV from 4 June to 3 August 2018. Through the cooperation between the ISPA and IKV, they were able to complete their obligatory practical course for their studies in IKV's Injection Moulding, Extrusion and Parts Design and Material Technology departments. Apart from gaining practical technical experience, the young French trainees also appreciated the opportunity to make international contacts and get to know the culture of their German neighbours. 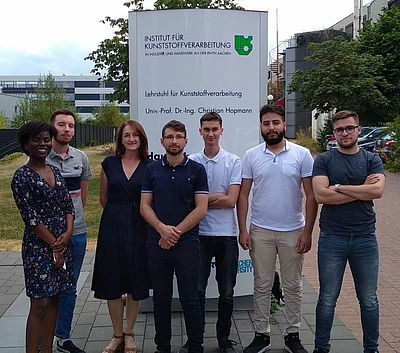 IKV is delighted with the international visit and hopes that the trainees will be able to use the experience gained to the benefit of their study course and later at the various French companies in which they receive practical training.